We take salt for granted but salt has played a major role in mankind’s survival. In fact, salt was once regarded as one of the most important commodities and led to early trade between various civilizations. The Egyptians of High Egypt, for example, exchanged salt for its weight in gold and ancient Roman soldiers were paid in salt when at war. In various religions, salt represents physical well being, vitality, permanence, loyalty, purification, protection and longevity. It also has metaphorical associations with life, death, and rebirth. It heals, it purifies, and it wards off evil. However, salt can also kill, and it is this duality that makes it clear why the 2D platformer Salt and Sanctuary treats salt as the most valuable element you can collect. Salt is essential in life and salt is essential in the game – a currency that can be collected from killing enemies and later, invested in leveling up your character; his or her armor; and the weapons you collect. And yes, you can lose your salt in battle but you are given one chance to reclaim it, if and only if, you manage to take revenge on whoever it is that killed you. It’s a nod to Bloodborne no doubt, but thematically using salt as a medium of exchange perfectly suits the gothic platformer that Ska Studios set out to make. Salt & Sanctuary wears its inspirations on its sleeve. It borrows the lore, character progression, class system, and even checkpoint system of the Dark Souls series along with the world progression, level design and the non-linear landscape of the earliest Castlevania games. Paying homage to two of the most beloved video game franchise while still finding your own voice is no easy task, yet the two-person team at Ska Studios made not only one of the best indie games in recent memory but arguably the best couch co-op game available on the Nintendo Switch. After sixty-five hours exploring every nook and cranny; fighting every beast and villain, collecting every weapon and item, and memorizing the labyrinth of environments you must journey through – all I wanted to do was play the game all over again. Salt and Sanctuary is so good, I honestly think this might be one of the most under-rated games ever made. Just when you think the game is nearly over, you realize you are only halfway done and can take a boat and visit the other end of the island. In Salt and Sanctuary, you’re tasked with escorting a princess by the sea who is to be married to an opposing country’s king in order to secure peace across two nations plagued by war. Just as your journey begins, it is cut short when a group of bandits attack your ship, murdering the crew and leaving you by your lonesome to battle a Lovecraftian horror, best described as a giant Kraken resembling Cthulhu. Midway through the battle, the ship is wrecked, leaving your soldier to wash up on an uncharted, nameless island. There, the player meets a mysterious old man who gives them an icon to offer to a shrine at a nearby sanctuary. In doing so, you swear an oath to a specific Creed – one of nine in the game. 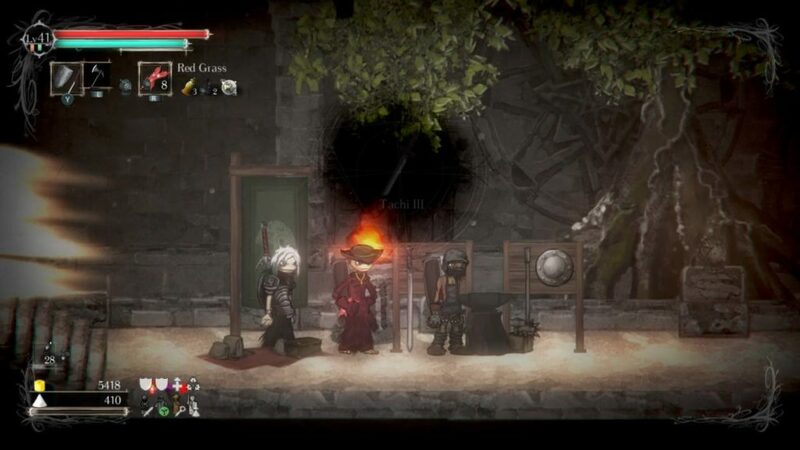 While there’s not much of a plot to be found here, Salt and Sanctuary is brimming with lore and at the center of it all is the different sanctums to pledge your allegiance to. Think of these sanctuaries as a safe haven or the equivalent of how bonfires are handled in Dark Souls. There, you can summon merchants such as blacksmiths to upgrade your weapons and if you desire, you can even buy new gear. The main purpose of the sanctuaries, however, is to allow you to replenish your health, level up your character and make an offering to your faction. It’s the religious angle that the game takes that sets it apart from its contemporaries. 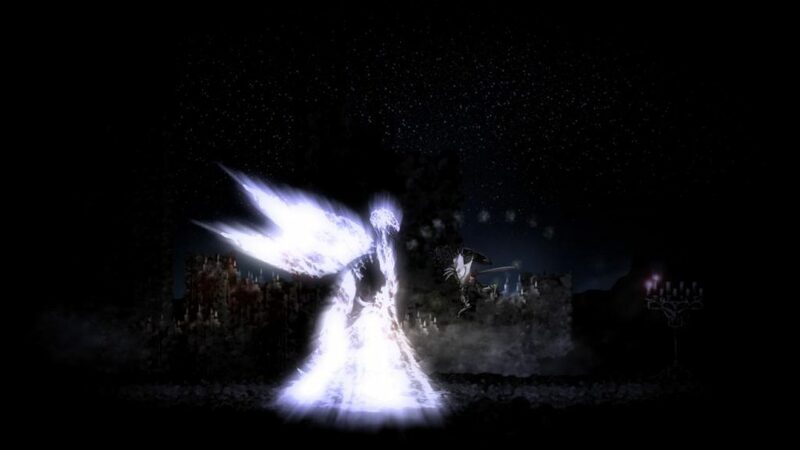 Despite its appearance, Salt and Sanctuary is a stylish spatter-horror exercise, which uses religious zeal to examine the intersection of fear and faith. Some sanctuaries are occupied by Creeds that are different from your own. The catch is, you can’t convert to that sanctuary’s creed unless you desecrate your own, something that comes with a high price. Desecrating a Sanctuary of a Creed is considered a sin and will turn any NPCs in all Sanctuaries under that creed hostile to you. Furthermore, the ending is decided by your Creed and the choices you make. The game’s real coup is in how it repeatedly shifts our allegiance from one Creed to the next, cross-examining the notion that barbarism is best countered with more of the same. 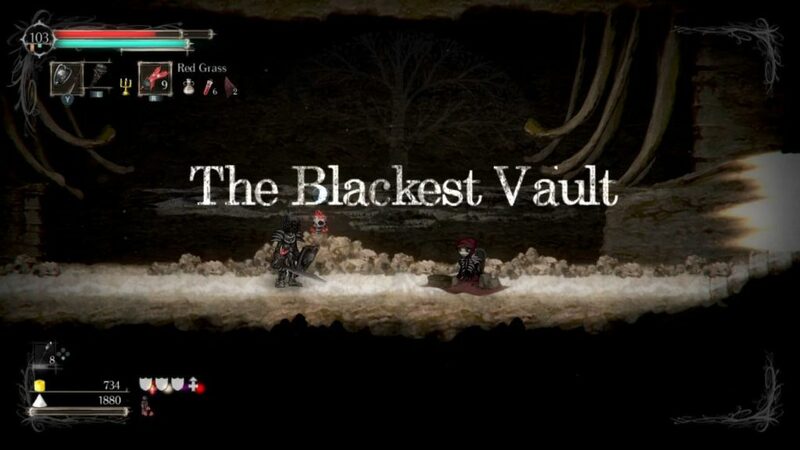 Of my 65-hour playthrough, the biggest highlight came when finding the Blackest Vault, an optional area that is only accessible after desecrating a sanctuary and then allowing its followers to straight up murder me. It’s a sacrifice you must make in order to pledge an oath to the Order of the Betrayer, the so-called “evil” aligned creed that has exclusive access to a set of items and dark magic you may (or may not) need to complete your journey. Adding insult to injury, your devotion to that creed will be reset, and you will not be able to rejoin that creed again unless you are lucky enough and find the Candlelit Lady, who can cleanse you of your sin. Joining the Order of the Betrayer also comes with another sacrifice as it curses the player with darkness. It’s a steadfast, haunting dissection of fundamentalism. It’s also a choice I just had to make, not just to satisfy my curiosity but because when playing S&S, you only have one chance/playthrough to join this Creed. If you answer no, you’ll never know the outcome. 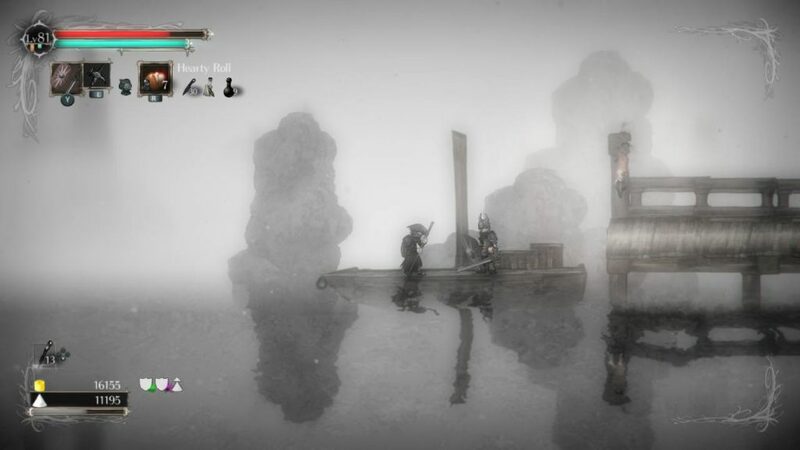 As indicated above, Salt and Sanctuary allows the players to make several choices throughout the game, something that not only makes it worth revisiting again but something that will also appeal to two types of players: Those who take pleasure in piecing together all the clues and understanding the lore and those who just want to hack and slash their way to the end. 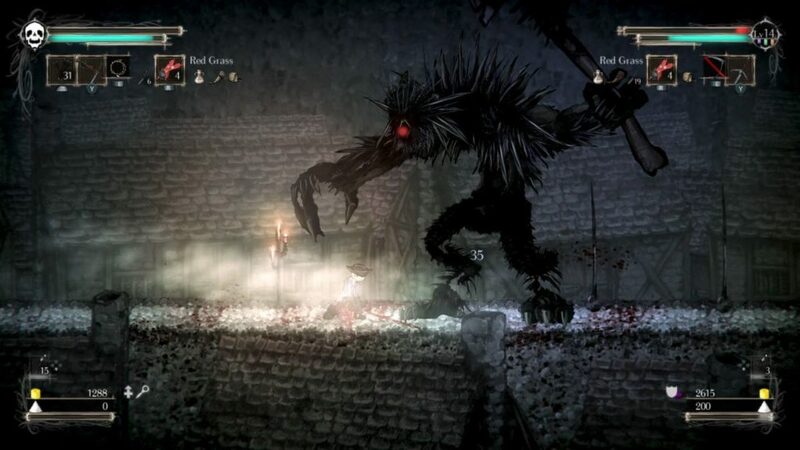 And while we’ve been inundated with Metroidvania-esque 2d platforms as of late, the world of Salt and Sanctuary feels so much bigger than most of its peers and more importantly, each stage is “blessed” with a variety of its own unique enemies, boss battles, visual aesthetic and atmosphere that is derived from medieval murals to Ptolemaic diagrams. 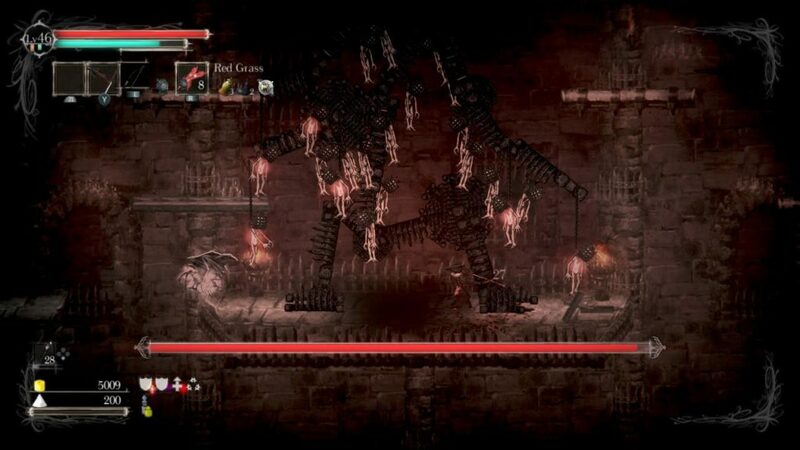 The world of Salt and Sanctuary is gigantic, with massive temples, castles, swamps, underground dungeons, creepy cemeteries and dark forests, all interconnected by hidden passages and shortcuts. And much like Castlevania, areas on the map will be inaccessible until you unlock new abilities (like the air dash or gravity reversal) and each area of the map is littered with obscure secrets and hidden loot providing players with a good reason to retrace your steps. The Festering Banquet (the second area) looks like an underground Egyptian tomb while the Village of Smiles is a massive graveyard-like area infested with creepy scarecrows and deadly skeleton-like creatures. 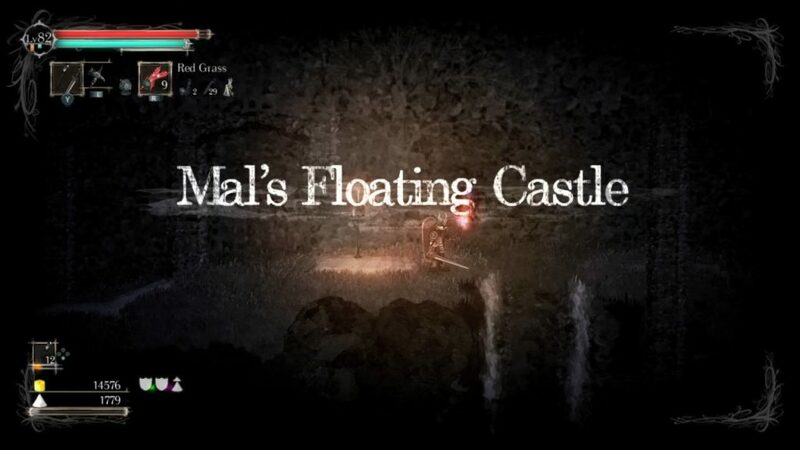 Meanwhile, Mal’s Floating Castle (an optional stage) is exactly what it sounds like– a castle floating in the sky and Mire of Stench sees your character running through a poisonous swamp. There are twenty-two areas in total, twenty-three bosses to fight, five side quests and over six hundred weapons, armor, and items to collect. Meanwhile, to get familiar with the lore, you’ll have to set aside some time and read popup text and speak to the NPCs you encounter along the way. It adds a layer of genuine mystery to the proceedings, but more importantly, as you unlock each level you’ll quickly realize how they all connect and appreciate just how incredible the level design really is. These dudes are straight-up assholes and kill you in one shot no matter your ranking. It’s truly remarkable that two people made such a massive indie platformer like Salt & Sanctuary especially given – and I repeat – every one of the choices you make has a massive impact on the overall experience. Characters are immensely customizable, allowing you to brave the bleak horizon with dagger-throwing thieves, whip-wielding hunters, sinister mages, armored knights, magical clerics and even a fucken chef who begins his adventure with nothing but an iron pot at his disposal (I chose the Simon Belmont-like hunter for my first playthrough). As you make your way across the dark island, you will come across a wide variety of items that you can use to refine and improve your equipment. Unlike Breath of the Wild, these items won’t break. However, if you trade in certain weapons you may miss out on unlocking more powerful items down the road. This is a mistake I made when selling the Kureimoa, the first Greatsword you’ll come across and something you need if you ever want to upgrade to any of the other nine Greatswords in the game. Murdiella Mal, the insectoid Kraekan, the Murderfly, the Queen of Moonless Sky. 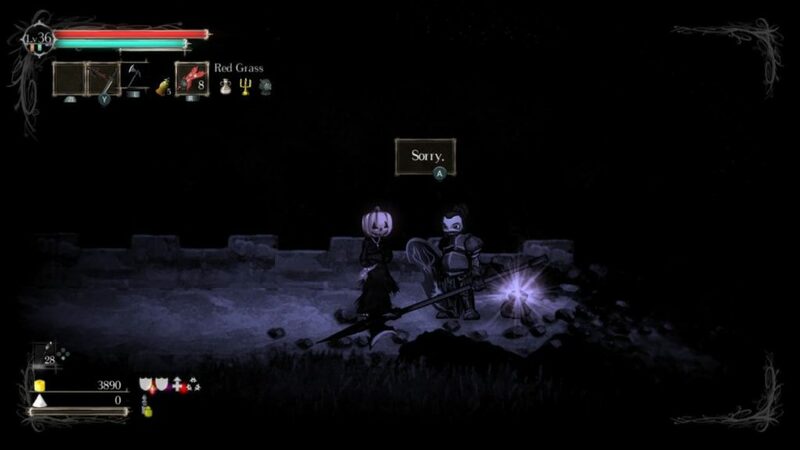 Much like the games that inspired it, Salt and Sanctuary is at times hard. You will die often, but the game gives you everything you need to survive. It’s not so much difficult as it is complex. For example, there’s a very large skill tree to navigate that contains different abilities that fall within one of six categories (strength, endurance, dexterity, willpower, magic, and wisdom). Weapons and armor can also be upgraded, and there’s a set of elemental magic powers to learn. When it comes to the boss battles, the trick is to understand their strengths and weakness. Murdiella Mal, a.k.a. the Queen of Moonless Sky, for example, is vulnerable to fire but more importantly, using arcane armour and weapons is highly recommended when fighting her. The game leaves clues just about everywhere to help the player. There are messages found in bottles scattered throughout every level that tell you what to do and what not to do (although sometimes you can’t trust these messages) and often when conversing with an NPC, the character will drop hints that can help you in the near future. In other words, pay attention. Ska Studios even added a candelabra in each level to indicate when you are about to step into a room that houses a boss. Yes, the game can be challenging but not in the same way a game like Celeste is. Celeste is a game that requires patience, determination and an ability to complete a sequence of precise jumps and dashes without a single mistake. Salt and Sanctuary is a game that requires the player to make choices and based on those choices, you’re either in for an easy ride or a challenge. Either way, gradually progressing through a campaign is incredibly rewarding once you’ve completed your task. One of the secret, optional levels in the game. The game may not be original, but it’s undeniably exciting and at times awe-inspiring. From the electric guitar/synth, organ soundtrack to the predominantly hand-drawn animation to the gratifying combat, and local cooperative play, Salt and Sanctuary puts a lot of triple-a titles to shame. The fact that a husband and wife team were able to so much with so little, deserves applause. Regardless if you don’t like the art style (which I absolutely love) or aren’t interested in 2D action platformers, there’s no denying the artistic merit the game has. It just goes to show that way too many critics (I use that term loosely) don’t review a game for what it is, but rather what they wanted it to be. For anyone who gave this game a bad score or a negative review, I challenge you to create something better. 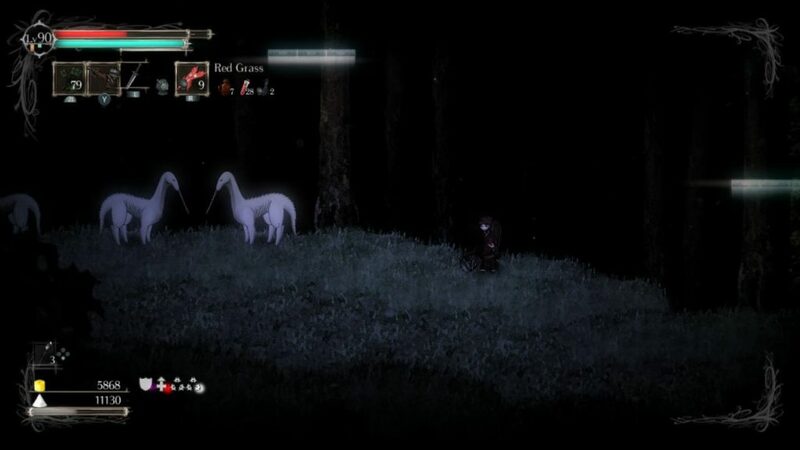 Oh, and did I mention it has some of the most creative enemy designs? With bosses like the Untouched Inquisitor, The Third Lamb, Kraekan Dragon Skourzh, Carsejaw the Cruel, The Tree of Men and Kraekan Cyclops, Salt and Sanctuary might have the best roster of any 2D game to date. Editor’s Note: I recommend that newcomers to Souls-like games read through this online guide before diving in. I wouldn’t read too much so as not to spoil the many surprises in store, but having a general understanding of each class and how the skill tree works, will help tremendously. Also worth noting; much like Metroid, Salt and Sanctuary does not have a map, leaving navigation entirely up to the player to memorize. I had no problem memorizing the layout since the map is designed to loop back on itself in a variety of ways, but some players may get lost. That said, you may want to take notes.